Before sitting down to write, do a body scan. It is helpful to sit or lie down for this practice, with your feet rooted in the ground. Start by focusing on your breath and watching it move from the bottom of your spine to the top of your throat. Sometimes it is helpful to envision a ball of light moving up and down the spine or to chant while breathing. This focuses the attention. Then you can begin the body scan. This is as simple as focusing on each part of your body individually for a short period of time. First, start with your toes. Feel whether they are tense, tingly, numb, or any other sensation. Tell your toes, “I accept that feeling” and then allow them to relax. Allow them to melt into the floor. After it feels like they have melted, move up to the higher levels of your feet, then ankles, even up to elbows and crown of the head. You can continue this practice throughout the day with your whole body or just one part of your body. When you are especially busy, it may be helpful simply to touch one of your chakra centers – put a hand on the heart, on the belly, on the solar plexus below your chest – and ask to connect to that energy. The key is to write from that space once you have done the body exercise. Don’t put too much pressure on it. After you have done these exercises, just start writing stream-of-consciousness style and see what emerges. …the memory of trauma, through repetition and the reinforcement of patterns, the body learns loneliness, self-destruction, body memory is paved into neural and muscular pathways…. Acknowledge the current patterns. In recovery circles I once facilitated, this was extremely important. The samsara cycle is a pattern of thought and suffering that sometimes gets etched into our brains like rocks being washed over by the same rocks continuously. The water deepens the etchings in the rocks. This is interesting to notice. Some of these patterns are helpful and some are not so helpful. This is interesting to notice. Also, don’t be afraid to build new patterns. I recently coached a friend of mine in doing a creative statement for a graduate school application. She was trying to see how the different parts of her life had connected. We had just seen an exhibit at the Brooklyn Musem titled “Gravity and Grace: Monumental Works by El Anatsui” which contains a few pieces made entirely of linked together bottle caps and tin can tops. At first glance, the pieces are impressive, large tapestries and golden legs that reach outward like the roots of a tree. Upon closer look, we see the bottle caps and tin cans and realize the intricate details necessary in building these structures. We worked on a few of the following exercises: Observe your own patchwork. Draw a map – a map of your childhood landmarks, of what you think your neural connections look like, whatever emerges. Even if images don’t seem to connect at first, draw or write them anyway. It is important to do this exercise from the body or from other media – draw, paint, play music, dance – and you will be amazed at the connections you can make with words after reflection on these pieces. If you are stuck, go see an art exhibit, a concert, or a play. See what inspires your body as well as your mind. Give yourself time and space without words – set a specific time – and then set a time to only write after that experience. These are just a few simple exercises. If they seem frustrating or don’t work for you, don’t do them. In uncovering what the body holds, it is most important to be patient. Our bodies are holding some of these traumas and memories to protect us. Let them sit if needed. Or peel them away gently. Try to enjoy the process. Let yourself laugh. Or let yourself cry. And then wait for the writing to pour out. Please support the journal in which you want your work published. Bombay Gin can be purchased through SMALL PRESS DISTRIBUTION, on our website, or by sending a check for $12.00, made out to BOMBAY GIN. Thank you for your interest in our magazine. Motivated by fear, what might have been. The mind creeps, creating language that lives in its own zone of experience. Shifting parameters afford access and change. Temporal variations and parallel modes of materiality. A meditation on what is to come progresses along with determination towards change. When afraid, the mind tends to wander in thought; it creates its own language called worry. Together, fear and worry imprison the mind in a place from where there seems to be no escape. Yet with the proper guidance, the mind and spirit can be freed from the trap of fear through reflection. Meditation, to be present in the moment, provides the necessary tools in order to change. To release fear through surrender is like exhaling the breath from the body. Variously, Not Then, a contemplative piece of literature by Travis Ortiz, invigorates the reader’s mind and spirit in a similar way. The book contains insights into the worries and fears that a person may encounter on a daily basis, something which the reader may reflect upon for guidance in his or her own life. Always noticed in the breath, that which is not inexpressive. Frequently in the text, Ortiz makes references to returning to the breath as an act of cleansing the mind or spirit. It is as if Ortiz is reminding the reader to breathe, to let go of the anxiety which his words may have built up, to contemplate the message he has written. This allows the text to speak, so the reader may hear what the words say. When he mentions the word “breath,” Ortiz asks the reader to return to his or her center, release the fear that weighs the spirit down. The word “breath” acts like a trigger for the reader, inviting him or her into the text to be mindful of the present moment, to breathe, live and enjoy life. A person should experience life, its beauty, as a living piece of art. The use in forcing the breath and approaching cyclical time theories which leads to an interpenetration in the best of taste, tone on tone so to speak. Ortiz, an author as well as graphic designer, intends for Variously, Not Then to be a graphic piece of art as well as a literary work. The book’s design subtly draws the reader’s attention to the beauty of each expressed thought. Blank spaces upon the page reflect a pause in the mind and body for the words. Ortiz adds depth to the contemplative nature of his book by expressing the printed words in an innovative matter. His visual art allows a natural energy of joy to flow, freeing the mind to function in its highest state of freedom; therefore, allowing the reader to be attentive. Water markings, in the form of various shades of lightness and darkness in text, function to imprint his ideas upon the reader’s subconscious minds. Ortiz plants the seeds of contemplation in the mind, which will later bear fruit. He uses the water markings to form their own separate narrative on the page, complementing the darker text. Larger, bolder text allows Ortiz to shout typographically, gaining the reader’s attention and stressing the importance of the ideas that he expresses. The blank space on the page between words once again reminds the reader to return to their center. One keeps going back in an attempt to realize there is more than one narrative running through here on the breath of excitation. Ortiz wants the reader to digest the material, to create his or her own personal meaning to the text, to read and re-read in order to experience the text from different viewpoints. The book contains no formal introduction so the reader cannot develop any preconceptions of the text. Ortiz does not want to taint his audience’s experience with his personal viewpoints. His carefully chosen words serve as a contemplative guide. By being deliberately vague he allows the readers to interject their own memories upon the page. A single voice emerges reminding one of the fact of breath. Another interesting characteristic of the book would be its title. When broken down, the title of the book contains contemplation unto itself, a simple reflection that Ortiz wants to convey to his audience while they read his work. The title brings up images of a reflective state of existence. Meditation tames the mind. At the same time, meditation is a tool that allows surrender to happen. When the contemplative state of mind is released it brings peace, and balance to life. Ortiz wanders through so many concepts, such as language, art, politics, history, what is beyond life, in order for the reader to meditate upon them, gaining a sense of peace within. Variously, Not Then provides the reader with a tool to take a deeper look into their own life. The words create a search into the soul, challenging the reader to be mindful of life in this world. Peggy A. Alaniz is a low-residency student at Naropa’s Jack Kerouac School of Disembodied Poetics. She resides in the small rural village of Jonesville, MI; however, come summer she will be living and attending school in Boulder full time. She holds a BA in History from Hillsdale College and a Level I & II Attunement in the art of Reiki. Peggy also holds the rank of Sho Dan in Sanchin Ryu Karate, which she volunteers to teach at a local community school . Bombay Gin editors are excited to continue our series of book giveaways celebrating our latest issue. I’m proud to announce the second of our Dorothy double-feature. 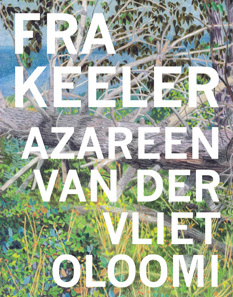 In collaboration with Dorothy, A Publishing Project, we are offering a free copy of Fra Keeler by burgeoning writer Azareen Van der Vliet Oloomi. Naropa University M.F.A. candidate Denise Kinsley’s review of Fra Keeler appears in our latest issue. Denise has written grants for several non-profit theatre companies and most recently won an award from The National Endowment for the Arts. She has been involved with theater companies in New York, Portland, and San Diego. …Fra Keeler summons thinking that traces back through my own memories and propels me forward to dreams of future events. It is an extended, manic episode through an unnamed character’s exploration of what’s real and what’s true. …Fra Keeler is an exploration and a performance of human consciousness. It reveals how the mind constructions illusion—such as momentary blindness—by attaching to dreams and memories. To read the full review, along with the latest in experimental literature and art, buy a copy of Bombay Gin 39.1: The Contemplative as Transgressive. For a chance to win a free copy of Oloomi’s haunting Fra Keeler, simply leave a comment below telling us why you’re interested. The window to enter this giveaway will close at Midnight MST on Monday, March 11th, and the winner will be randomly chosen via random.org.